Too often customer service teams for companies are making the news for all the wrong reasons. The truth is that all bad service is noticeable; it’s something that everyone as customers consistently takes note of and feels slighted by. When the waiter at a restaurant completely blows off your request for a refill of soda or a phone representative puts you on hold for half an hour - stuff like this drives customers crazy, and rightfully so. When working with Marksman, we don’t want to bounce you around from phone rep to phone rep, and make you wait hours on end for any real answers. That’s why every Mortech customer is assigned a dedicated account manager for all of his or her needs. And it isn’t just someone we hired on a whim, our account managers have an average of five years experience with Mortech, meaning they know our system and its workings well enough to give you the answers and solutions you need. And it’s not just about getting you the answers you need, but getting them fast. 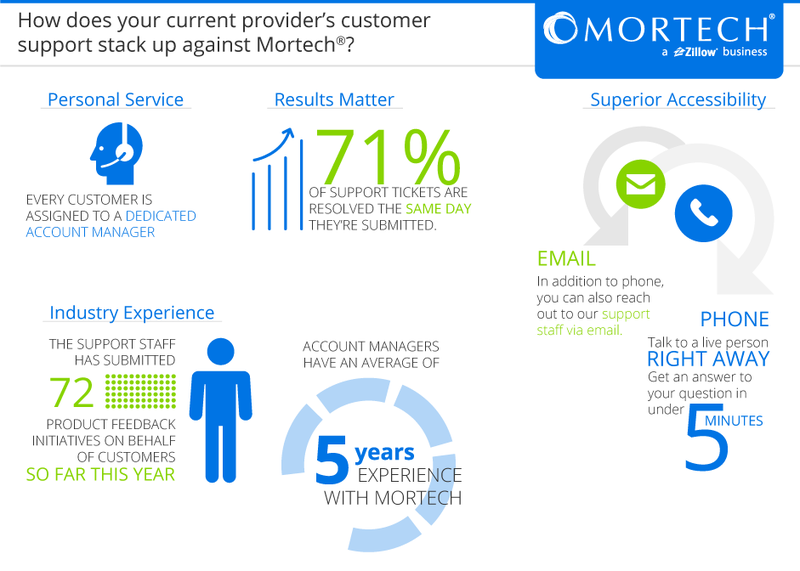 Mortech’s support team resolves approximately 71% of support tickets the same day they’re submitted, making sure the problem isn’t something you have to sit on for days on end. Furthermore, when calling in with a question, customers are connected with a support representative and getting an answer to their question in an average of four and a half minutes, ensuring they can spend the majority of their time working with customers rather than troubleshooting their software. Mortech’s support team is also constantly working on making things better and easier for you at every step of the process, and is always looking for new ways to improve our system. So far this year, our support staff has submitted 72 product feedback initiatives on behalf of our customers, making sure that we’re always working to give the best of everything. Want to know what customer service this good feels like? Schedule a free demo with Marksman today and find out about everything that you’re missing.